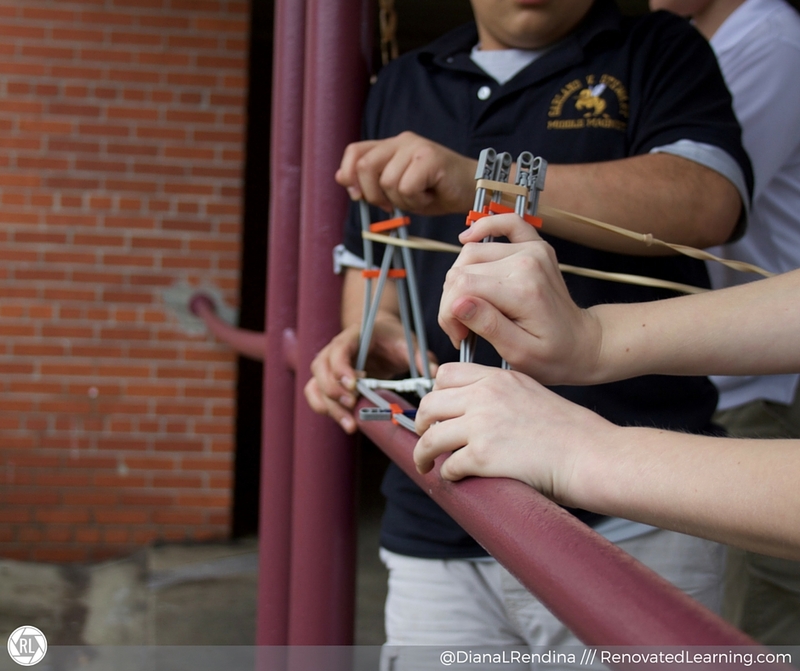 If you’ve been following Renovated Learning for awhile, you might remember the Catapult Challenge my Stewart Makers Club did last year with Colleen Graves’ students at Lamar Middle School. My students had SO MUCH FUN with that challenge, although I always felt like Catapult Challenge was a bit of a misnomer, since our students’ creations included catapults, trebuchets, crossbow, slingshots and more. When I revisited the idea this year, I decided that rebranding it as the Rubber Band Launcher Challenge made more sense. I offered this as a possibility and surveyed my students on what they wanted to focus on next, and this challenge won hands down. 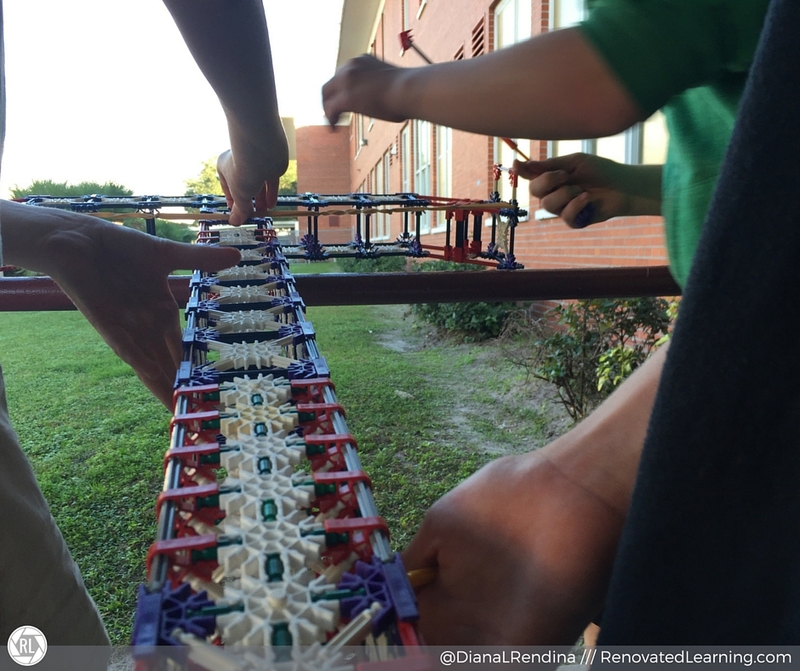 Here’s my advice on how you can run a Rubber Band Launcher Challenge with your students. I find that one of the best ways to start out any kind of challenge is to offer students some examples to inspire new ideas. For this challenge, I showed my students the video I put together last year of our Catapult Challenge with Lamar, seen above. I had butcher paper and markers out at our tables, and I encouraged my students to start drafting out their ideas and planning. No point your creation at another student EVER – Because even if they’re just playing around, it just takes one slip to poke your eye out. Seriously though, make sure that your students understand that these are not to be used as weapons against each other or even pointed at others as a joke. Designate a TEST LAUNCH area – Students want to practice their launches, so they need a place to do it. I didn’t designate a space last year, and we ended up with bystanders in the crossfire and a broken television screen. This year, we opened up the backdoor of the media center and had an outdoor launching zone onto a field. We also designated a smaller zone in the library stacks. Medieval weapons are fine, but no guns – This is a personal one for me, and I admit that it wasn’t very popular with my students. I came to the decision after several of my students had built machine-gun models out of K’nex and were basically playing war games right as our administration walked in. With the horrible rash of school shootings that have happened in recent years, I just wasn’t comfortable anymore with students creating pretend guns. Use your own discretion. In general, just one rubber band doesn’t seem to be enough for the launchers my students were coming up with. So I taught them a trick of how to tie two rubber bands together – check out this video if you’re not sure what I mean. That’s not the only way, and it can take a bit of practice to get the hang of it, but once you’ve mastered this skill, there’s no limit to your rubber band lengths. 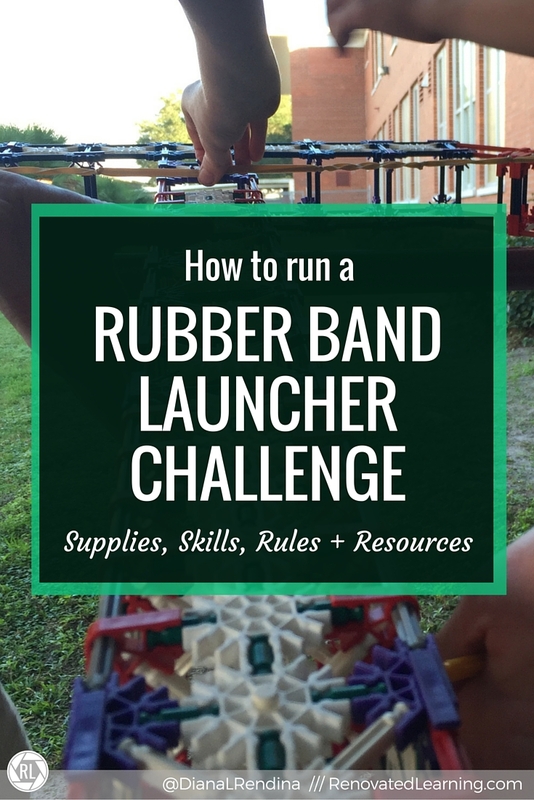 The main requirements for a launcher challenge are something stretchy (like a rubber band) and something firm to attach that to (such as K’nex, LEGOs, etc). It’s also good to have supplies out for students to draft ideas, and some computers or other internet connected devices for students to research ideas on. 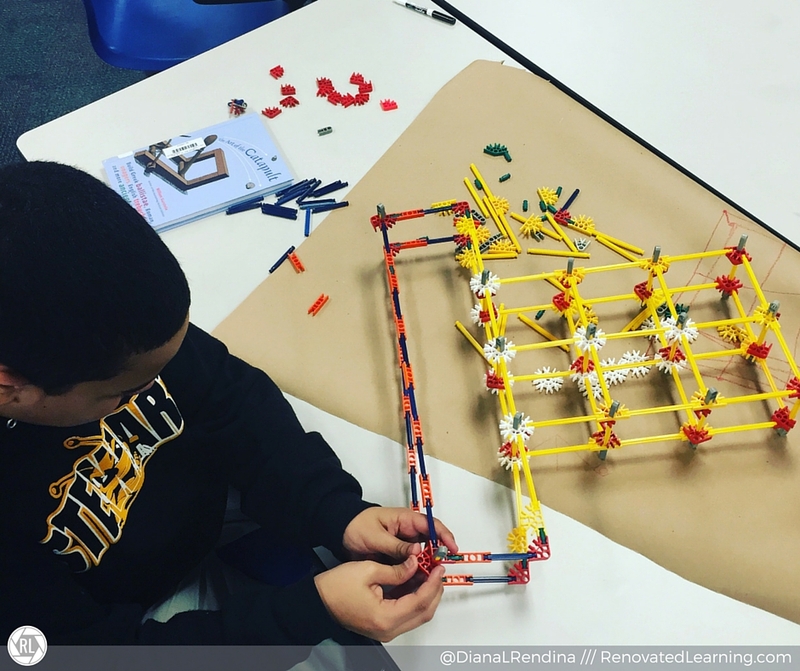 Last year, my students went with all sorts of materials, including K’nex, LEGOs, pencils, cardboard, etc, and one of Colleen’s students even built a catapult out of wood at home. This year, all my students ended up using K’nex. Students drew up drafts of their ideas. Some also consulted books & other resources. Instructables – Search “rubber band launcher”. Several of my students started with an Instructable for their base idea and then altered it. Rubber Band Power: 7 Stretchy DIY Toys – This article from Make is more than just rubber band launchers, and could provide some good ideas for your students. Elastic Band Launchers from Housing a Forest – This is a great project idea – build something to launch a paper airplane. The Art of the Catapult: My students used this book a lot during our challenge. 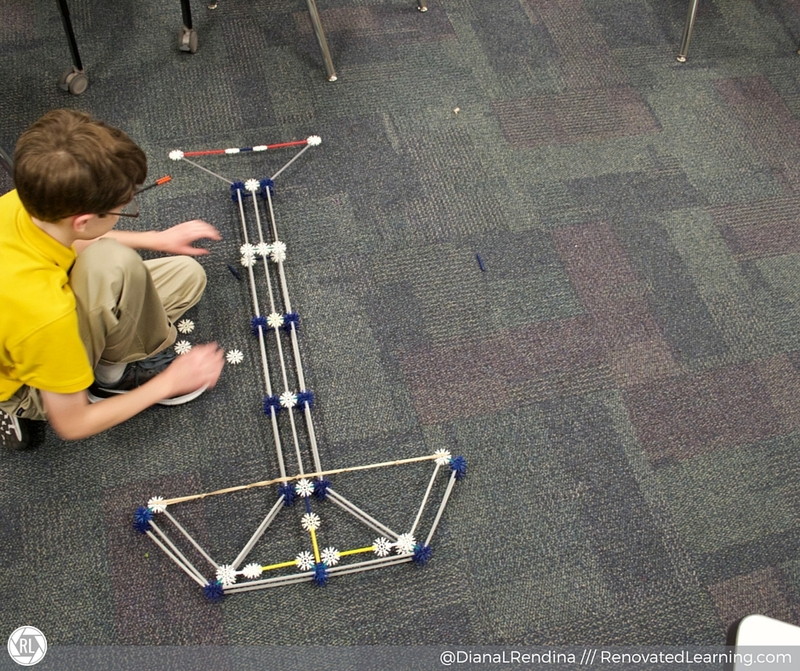 Have you run a rubber band launcher challenge in your makerspace? Tweet it to me @DianaLRendina with the hashtag #launcherchallenge and share what you learned in the comments.